off road dirt bikes for sale, the online stores to visit. Question it all and only then feel happy. When purchasing off road dirt bikes for sale there are a number of things you MUST check. 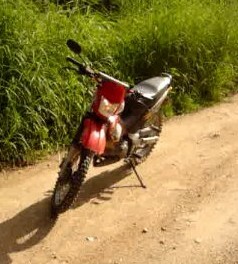 Dirt bikes can be used HARD by inexperienced riders, and therefore take great punishment so it’s not uncommon to find very cheap but very damaged bikes. In such instances it could cost you wads of cash to repair; and when you come to sell a used dirt bike you may not get anywhere near the same money back. To solve this problem - take your time in your choice of motorcycle, ask questions and test ride the bike. If you still don’t feel happy with the bike - don’t buy. If the motorbike has lots of paperwork / receipts, and looks clean and looked after, they are the bikes to start your search with. Also if the home you go to view the motorcycle has immaculate lawns and driveways....it gives you an indication about the owner. Cheap used dirt bikes don’t have to be scrapyard junk. Any pre-loved vehicle shouldn’t offer death on two wheels but enjoyment - if you know what your buying. Do be careful of very very cheap motorcycles as you could well be buying dirt bike salvage dressed up as a great MX ride - or a stolen vehicle. Its sometimes a benefit to be suspicious. We’ll explain a number of off road dirt bikes for sale that should see you riding the tracks for cheap bucks. 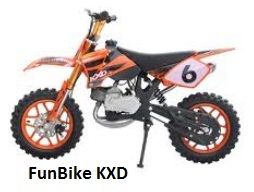 Funbikes.co.uk is a uk store that always has a range of new 50cc mini dirt bikes, ideal for beginners. Up for sale was a FunBike KXD 50R, going for only £345. This tiny two wheel motorbike has a restrictable throttle, chunky tyres and uses the simple Rev ‘n Go - electric start. The clear pics show it will easily fit in the back of a car, and the motor is so strong it will pull your parents easily around the local park - if they wish to jump on and have a go as well. Also available was a Mini Dirt Bike KXD 50 in eye popping KTM Orange. Selling for £179.99; any generation of kid will love its new Frame Design, offset by its vibrant KTM plastics, enclosed chain, restrictable throttle and big bore exhaust system. Plus wavy disk brakes front and rear, chunky tires with cool looking chrome rims are all included in the final price. Cheap bikes – not bank-busters! A few picks that show bargains are out there right now. 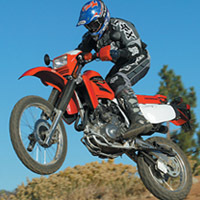 Mxchange.co.uk is an excellent place for most off road dirt bikes for sale . It’s a classified site for those riders selling mini motorcycles or even a rare vintage Motocrosser - and everything in between. Ok so what’s available? What about a 2005 Kawasaki KX 250, which has been looked after with regular maintenance. Price was £1,100 – and for that you got ZETA unbreakable leavers, renthal sprockets, a pro circuit pipe and monster graphics. The owner has become interested in the bigger four strokes so this MX bike has to go! For the same price of £1,100 - mxchange.co.uk had a pretty clean 2005 Honda CRF 250F 4-stroke. Why was this off road dirt bikes for sale model so special? It caught our eye as it came with many parts. Such as new brakes, fenders and wheels - plus it had regular oil changes and a spare set of plastics for the entire bike - so not bad for the money! Ebay is always a good choice if you need parts in a hurry. It’s a big directory but there is a huge plethora of used motorcycles you don’t see anywhere else. We discovered a YAMAHA YZ 125 motorcross bike priced to sell at £1,299. Not quite wholesale prices we know – but it came with new brake pads, a top-end rebuilt engine and a new chain and sprockets. Also on offer was a KTM 85 SX BIG WHEEL model at a competitive £1,350. Coming with renthal handlebars, wavy disc brakes and complete with the user manual and the KTM case. Its a great off road dirt bikes for sale model, that would be hard to walk away from. If your thinking of a helmet for this new bike of yours - you can't go far wrong with slyfoxmx.com. Their sales are legendary and we liked the CL-X5N Kane Helmet on sale at $78.95. Any helmet you buy should be SNELL/DOT Approved like this one was. Slyfoxmx.com has plenty of helmets just for girl riders, and this seems to be a breaking market – so do ask about their newest ranges. Don’t get hung up on slight niggles you know you can fix for a few bucks, and let good off road dirt bikes for sale - pass you by. Buyers can kick themselves for letting good deals slip. Dirt bikes with free shipping. While it’s true some stores do offer free shipping this is getting less so. Even a small pitbike can weigh-in pretty heavily and the cost has to be absorbed by someone. Most stores will show clearly their shipping costs and some are better than others, particularly if you pick a store close to home. If that’s the case make the store owner an offer you can come and pick it up – that way a few dollars of gas is all it will cost to grab your new bike. Free shipping is becoming something of a rarity for complete bikes these days. So be aware of it. If you see an unbelievably cheap pitbike or off road dirt bikes for sale, check the shipping costs you can guarantee they will be high – thus taking out any profit you thought you had in the bike. We are not saying free shipping might be gone forever, but just double check on that fine print, and email the store if you need a direct answer on shipping prices when you buy off road dirt bikes for sale.